1. 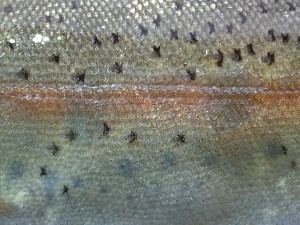 Problem: Do you imagine the trout may think it is an epic hatch when you false cast a bunch? Sure you might catch a flying fish or a squirrel. Solution: Not likely since fish tend to feed in the water. Learn to deliver a pickup, setup, and a delivery cast which might take you a few trips to the yard to perfect or a casting lesson from a certified instructor. 2. Problem: You probably have much more experience searching the internet at your day job for fly fishing techniques and topics which always prevail over those who are actually on the water. You do not need to listen to your guide who fishes daily because you have fished in Alaska. Solution: Learn new things through the actions of doing will help create a quick learning curve. Actual fishing on the water will be more valuable than reading about it or videos. 3. Problem: Do you really think the magic fly that you keep searching for like an illustrious unicorn has a chance for saving the day with smashing numbers of fish to the net? Solution: Perfecting better presentations on the stream tend to always win over the “magic fly” followers. “Magic fly” followers tend to be delusional while the presentation folks tend to solve problems. Fish enjoy eating lots of different flies on the stream when the drift is correct to their mood. 4. Problem: Losing dozens of flies and breaking many tree branches is normal for you because remember you are an advanced fly fisher. Solution: Chances are if this is happening often on the stream you need a casting lesson first before even fishing because it should be enjoyable! 5. Problem: Casting accuracy means it is fine to rip your line off the water (SPLASH) because you have missed the spot you were aiming at the past 50 attempts. Solution: Let it drift out of the area you are trying to cover before casting! A few trips casting in the yard should help increase your accuracy if you have some foundation. If you lack a basic casting foundation then take a lesson from a fly casting instructor! Avoid like the plaque the college kid who likes to fish and guides on the weekend. Chances are they simply have not taught enough to be effective. 6. Problem: The fly fishing advertising campaign for high tech gear is out of control and regardless how much money you have dumped into gear it will never make up for learning to correctly use your gear. Solution: Take a lesson to go along with your $ 850.00 new rod because you are the pilot! It only does what you command it to do for the good, the bad, and the ugly. 7. Problem: Do you feel good about rigging because the past 25 minutes for changing out a single fly is much better than the guide who takes 20 seconds. Solution: Learn to tie your knots in the winter months and get really efficient with the few you use rigging! 8. Problem: Have you ever been working the water in a great area for fish with no strikes yet expecting a different result over a long period of time? How sure are you that the fish are even there? Solution: Change tactics, change rigging, change position, change casting angle for fly entry into the water, change depths and you can make it happen! Learning to read water for the different times of year is invaluable to the fly fisher because you need to cast where the fish are present. 9. Problem: Setting the hook by jerking the rod vertically and missing dozens of fish or worse breaking them off is the norm because practically everyone is doing it. Maybe one of the small ones will eventually come to the net if you keep at it long enough. Solution: Most important thing is to first admit that there is a problem! Take a lesson from someone that can really teach you the techniques on hook sets. 10. Problem: Getting lots of leader knots on every other cast with tailing loops is O.K. because knot tying and rigging is fun! This is one of the main reasons new fly lines have the coatings shredded around the fly line like someone used a pair of wire cutters. Folks tend to jerk the mono rather than clip the mono knot off of the line when knotted. Line companies constantly replace these for new folks even though it is casting problem. Tailing loops are great for creating a beautiful birds nest of mono art! Solution: Take a lesson and learn to fly cast. Chances are it is not in your DNA naturally as so many believe. Fly casting takes a sliver of commitment by actually practicing in the yard, especially for new fly fishers. All of the hot fly fishermen enjoy fishing more than knot tying! Cast less and fish more is a great motto to remember for being cool!